Mozilla has temporarily stopped delivering the latest version ofFirefox 16.0, due to a security vulnerability. Mozilla will automatically upgrade users’ browser to the new version once the problem is fixed. Users who had already upgraded to version 16 can downgrade back to Firefox 15.0.1 by following these instructions. 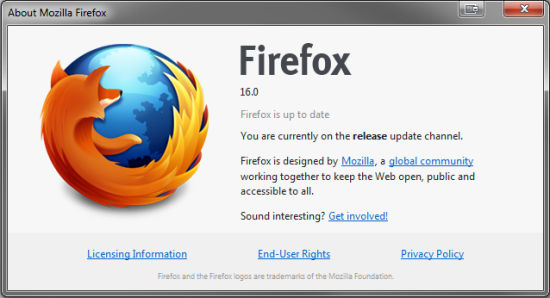 FireFox 16 moves to release on October 9th according to the Mozilla releases wiki. While there hasn’t been the formal announcement on the Mozilla blog one is bound to be posted today for general availability tomorrow. If you’re not one for waiting though you can download the final release version right now from Mozilla’s FTP servers here: ftp.mozilla.org/pub/mozilla.org/firefox/releases/16.0. With incremental GC, Firefox responds more quickly to mouse clicks and key presses. Animations and games will also draw more smoothly. The other notable thing is that Web app support is coming to FireFox 16. “Web apps are apps built using standard Web technologies. They work in any modern Web browser, and can be developed using your favorite tools. Some characteristics that distinguish Web apps from websites: Apps are installed by a user, they are self-contained and don’t always require the chrome of a browser window, and they can be built to run offline. Gmail, Twitter, and Etherpad are Web apps.” Like Chrome before it we won’t really see the benefits of Web app support in FireFox 16 until developers start coding for it. If you do web development you should certainly check out Firefox 16 for developers which outlines the changes developers need to be aware of in FireFox 16. If you’re an add-on developer hit up Add-on Compatibility for Firefox 16 to see the list of changes that went into Firefox 16 that can affect add-on compatibility.